Finally, a family-friendly camera you can take everywhere! The COOLPIX S31 is waterproof, shockproof and dustproof, so even the roughest conditions won't stop you from recording precious memories. Shoot beautiful 10-megapixel photos and 720p HD videos in the rain, at the beach, in the pool or sandbox—places you wouldn't dare bring your old camera. Plus, with oversized buttons, super simple operation and a bright 2.7-inch LCD, every member of the family can have a turn. 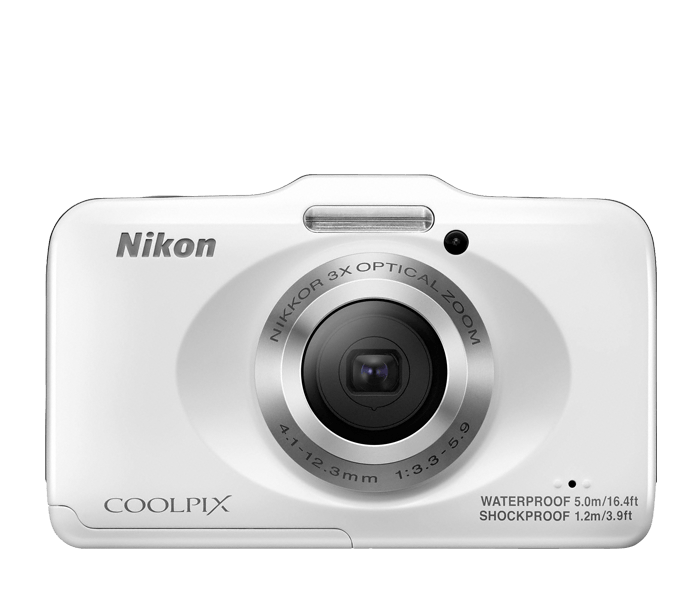 The COOLPIX S31 is so easy to use, anyone can take great photos and videos with it. Just turn the camera on, point, shoot and marvel at the results. For maximum point-and-shoot convenience, select Easy Auto Mode. It automatically optimizes the camera settings for each shot, no matter how challenging the situation. You'll be free to enjoy the moment while you capture it. When a photo alone won't do, press the dedicated movie button and instantly start recording 720p HD video in widescreen format while the built-in microphone captures the sounds of the moment in high fidelity. When you're ready to share your creations, connect the COOLPIX S31 to an HDTV and dazzle your friends and family. Instantly review and laugh over the pictures and movies of the day with the easy slideshow mode. Select playback effects and built-in music to accompany your show—fun to share with friends and family. Connects easily to a TV (optional EG-CP14 audio video cable required). Share the sights and sounds of your adventure. With 3x optical zoom power, the COOLPIX S31's genuine NIKKOR glass lens is great for everything from wide-angle group shots to close-up candid portraits. Not sure which Scene Mode to choose? No problem! Select Scene Auto Selector and let the camera make the call. From Night Portrait to Backlighting, the COOLPIX S31 will use the best Scene Mode for your situation. Easily apply fun and creative Image Effects like Highlight colors, add a diorama effect, soften pictures and more right from the camera—no need for additional photo or video-editing software. Electronic Vibration Reduction helps keep the shot steady, even if your hands are not. Say goodbye to blurry photos, shaky videos and tripods. *Based on Camera and Imaging Products Association (CIPA) standards for measuring the life of camera batteries. Measured at 23(-/+2)°C; zoom adjusted with each shot, flash fired with every other shot, image quality set to Normal, image size set to 3648 × 2736 (10.1MP). Battery life may vary depending on shooting interval and length of time menus and images are displayed.